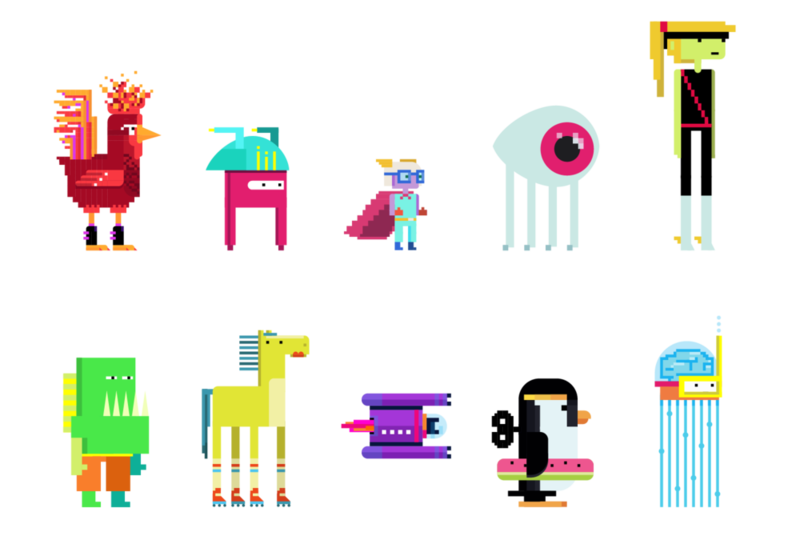 ILLUSTRATION: Reimagining classic arcade game characters and components. Infinite Arcade is app No.4 of Tinybop's Digital Toys series which encourages kids to explore their imagination and tell stories while building their very own arcade games. I collaborated with my teammate, Roza Gazarian, to illustrate, design, and art direct this app using retro pixel video game art as inspiration. Read more about our process and inspiration in this interview. Users can choose between 9 characters, 5 balls, or create a custom avatar to be the protagonist of their story. Enemies can be used to increase the difficulty of the game. While illustrating each character, I gave them a name and distinct personality which informed the way they move and react. All characters and parts are designed on the same pixel grid to give the style consistency. For a modern twist, we chose select moments to break that rule and add a few curves or angles. Brainstorming playful ways to represent classic game parts. Initial sketches for various game components. With over 40 parts and pieces, users can create very rich and detailed adventures utilizing many types of terrain, hazards, collectibles, sounds, and text. We mapped out all the parts onto post-its and brainstormed playful ways to reimagine classic game components and how they might vary visual between worlds. To offer users more visual customization we illustrated 6 world themes with corresponding game components to match. A user can easily preview their game in different worlds and see how their previously added parts update to match that visual theme. See how a few parts transform between themes below. A few games (new and retro pixel art) we looked at for inspiration: Donkey Kong, Attack of the Killer Tomatoes, Sunburn!, and Sword & Sworcery.